Brad Pitt's Birthday Surprise For Angelina Jolie! Brad Pitt’s Birthday Surprise For Angelina Jolie! Brad Pitt may have had a string of red carpet appearances and a packed promotional trail to contend with, but that didn’t mean he let Angelina Jolie’s birthday slip by unannounced. Romantic Brad planned not one, but two special surprises for his fiancee, who turned 38 yesterday. First up, was a romantic meal at exclusive Paris restaurant Il Vino, straight after the premiere of his World War Z movie in France. Sources say Brad Pitt arranged the dinner personally on Monday afternoon, booking the eatery’s famous tasting menu, accompanied by wines chosen by the winner of the World’s Best Sommelier award. Afterwards Angelina Jolie enjoyed a tiny birthday cake, prepared specially by staff. ‘Their main plate was langoustines with a French wine. And there was a dessert – a cake, because it was her birthday,’ one onlooker told American magazine People. ‘It was very subtle, real cool,’ another added. Round two of Angelina Jolie’s birthday celebrations came in Berlin, where she and Brad celebrated her special day with children Maddox, 11, Pax, 9, Zahara, 8, Shiloh, 7, and twins Vivienne and Knox, 4. This time, the whole family were spied hopping into a car to Kuchi Restaurant, close to their hotel. 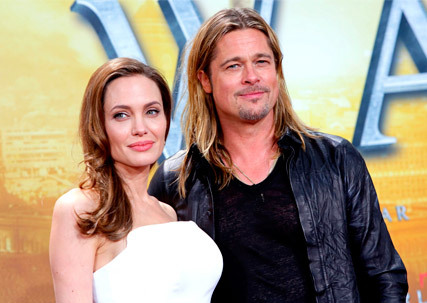 Brad Pitt and Angelina Jolie looked better – and more in love – than ever as they stepped out at the Berlin premiere of World War Z last night. Stealing the spotlight away from her movie star hubby, Angelina wowed in a custom made white strapless Ralph & Russo dress, complete with a swirling peplum that emphasised her tiny waist. Earlier this week the actress said she is feeling much better, after undergoing a double mastectomy in February this year.